« Galway Fest 2019: Win a Ripper! 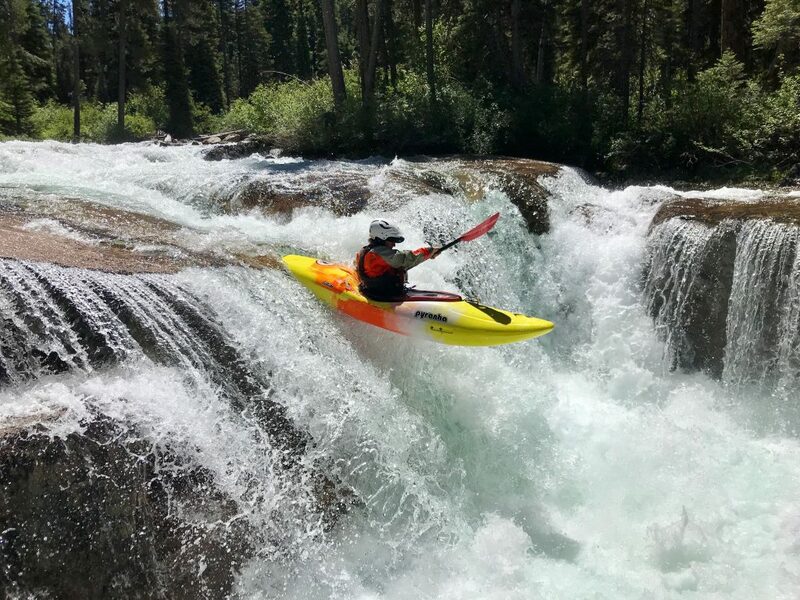 Banks, Idaho within the whitewater world is commonly referred to as the “center of the universe” due to its abundance of easily accessible whitewater of all levels of difficulty, a centrifugal force pulls dirtbag whitewater addicts in from all over the world during the summer season. I arrived in this magic little corner of the United States in mid-May and was blown away by the amount of world-class kayaking there was to be done. By the time the North Fork Championship was rolling around I had done a handful of trips in the Salmon drainage and cut my teeth on the North Fork at a range of flows, now the water was dropping in the natural flowing rivers and the North Fork was settling into summer flows. Seth Stoenner, local bad boy and kayak phenom, walked into the Banks Cafe (my temporary place of employment) one beautiful afternoon to discuss potential options for a mid-summer exit strategy to get away from the heat, luke-warm water, and crowds of retired baby-boomers towing their campers to McCall. Among the possibilities mentioned were a handful of rivers in the High Sierra or the Canadian Rockies. 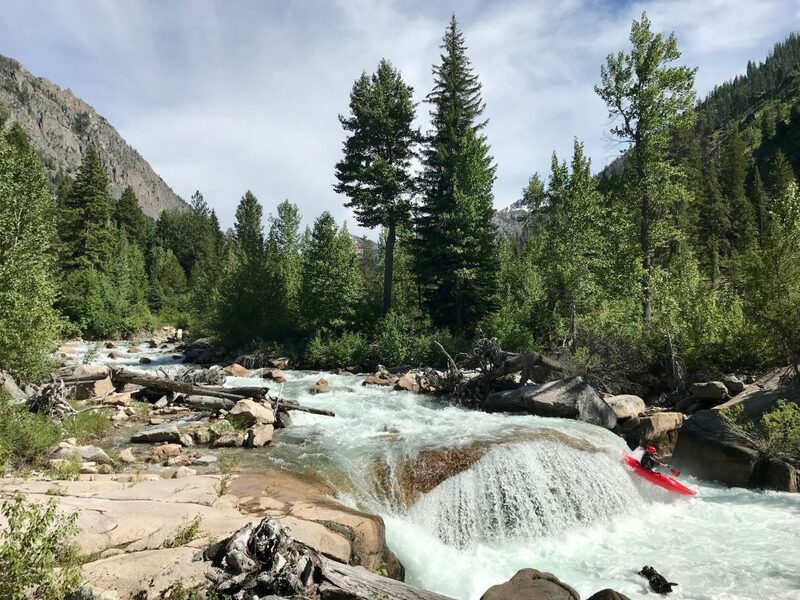 Eventually, Seth suggested we could do a “pretty chill” overnighter on the South Fork of the Payette, and it was right here in Banks and required much less driving and logistical planning than the other options. This idea first started as a simple trip up to Grand Jean where we could then paddle 60 miles back to banks over two or three days through several sections of flat-water and class II-III. Seth then mentioned a gorge just a short hike up from Grand Jean that had only been run once a couple of years ago by local legend Brian “B-Reel” Ward. Seth had scouted this section the fall of the previous year and showed me some pictures of what was up there. He then said there was likely white water that was just as good upstream of Elk Lake where B-Reel put in, and this was where the ever elusive elixir of words “first descent” was first mentioned. Seth said he didn’t know if any kayakers had ever scouted the whitewater upstream and felt pretty sure that no one had been above Elk Lake with a kayak before. From what we could see from Google earth (Seth did most of the research ahead of time), the section above the lake had a handful of bed-rock slides with a waterfall or two thrown in the mix and also lots of wood (naturally, it is Idaho). It was apparent that the only reason no one had checked this section out before was the sizable amount of effort that would be required to get in there with a kayak and the guarantee of portaging many a log-jam along the way. There are well-established backpacking trails up and down the entire river, but to hike up from Grand Jean meant more than 15 miles of hiking with a kayak and a journey that was anything but direct. The other option for an approach was a ~10ish mile hike in from the Stanley side of the Sawtooth Mountain range. 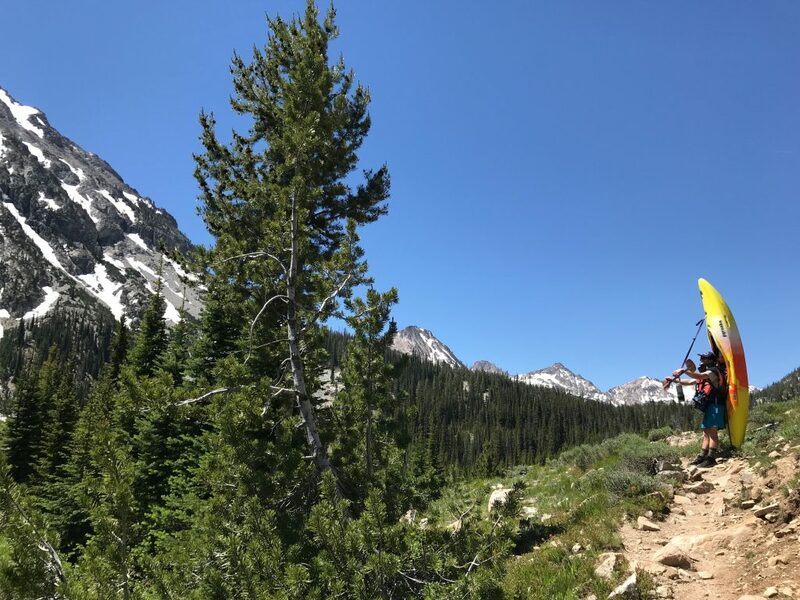 Seth found a series of trails that started just above yellow belly lake connecting to some other lakes before eventually leading up and over a mountain pass at about 9,000ft. From the pass, we could follow a trail to Virginia Lake which was the very source of the South Fork of the Payette. It sounded like a proper suffer fest that could potentially lead to sub-prime whitewater. However, we were bored, hot, and keen on an adventure we didn’t have to drive far for. The weekend of the North Fork Championship rolled around, and Seth said we needed to get after it soon. He talked to B-Reel, and their conversation seems to reinforce his stoke for the whole idea. We got off work, acquired supplies and made a plan to go from the source of the South Fork to Grand Jean in four days, allowing plenty of time for the 10-mile hike and roughly 20 miles of whitewater. We were able to talk another friend and Banks local, Ryan Holmes, into joining us on our mission. The night of June 24th, I finished my closing shift at the Banks Cafe, loaded up gear and boats in Seth’s truck, and started driving up the South Fork of the Payette River. We made it Grand Jean that night where we camped out, and the following morning we left Ryan’s car next to the river and piled the three of us plus a shuttle driver into Seth’s short cab Tacoma. We made it to Stanley and started the hike around 10 am. Here I am taking in the views along the way in the first few miles of the hike in. The first several miles were very scenic and easy going. It proved to be a nice trail with gentle gradient throughout. By roughly 1 pm, we had covered a fair bit of ground and began what we expected to be the steepest part of the trail past Edna lake and toward the pass. We made it to the base of the pass around 4 pm and found that the trail disappeared under snow and ended up going off trail over a medium sized talus field that proved to be treacherous to navigate with our loaded kayaks strapped tightly on our back. These packs served dually as spinal sails blowing in the mountain top wind, as well as a one-way ticket to the bottom of the talus field (if we fell on our backs while stumbling through the spotty snow covered maze of unconsolidated microwave sized blocks). The last 20 feet to the pass was a steep snow bank that appeared from the bottom to be an impassable cornice that we could avoid on a steep rock path. Upon arrival to the base of this snow bank it was clear that the rocky path was exposed and loose, and with their superior experience with snow Ryan and Seth decided to forge up a weakness in the steep snowbank. 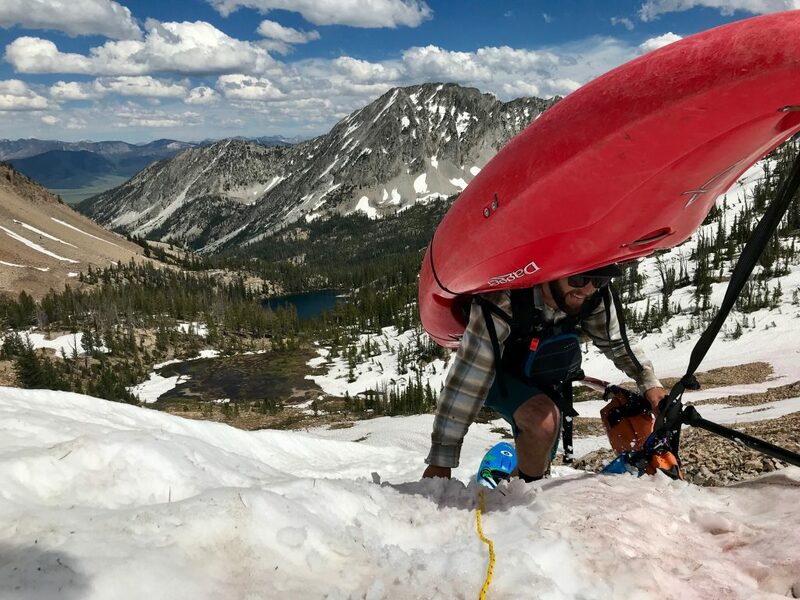 I followed, roping my kayak up the snow once I was safely on top. Once we all made it through the snow, we abandoned our heavy loads to climb the remaining 5 feet of incline to finally get a view of the canyon we were going to descend. After a brief snack, we scurried down the hill, crossed two more lakes, and made camp at Virginia lake. Most of the night I spent lying wide awake looking at the moon, fending off mosquitos, and dreaming about what may lie downstream. Ryan, making the final push over “Banks Boys Pass” as we forge a trail up and over a previously unnamed pass and into the South Fork Drainage. The next morning we woke up early, ate a quick breakfast and began hiking down the trickle of a stream hoping it would pick up more water and we could start kayaking soon. From the lake, we could see two more tributaries emptying into the central vein of the river shortly after the source so we were sure the steep mank of the youthful river would soon pick up into something more mature and substantial. We were lucky that the backpacker’s trail ran pretty close to the river at this point, so it was easy to make downstream progress on foot in the first 1-2 miles of the stream. Eventually, we began passing slides that looked runnable but not that fun, so we decided to leave those for the next crew. We finally slid into the river at a flat spot where it looked like the stream might have picked up 200cfs. The first few rapids we ran were small class 3-4 drops that required high precision manoeuvres. We portaged one 20-footer that looked like it would go with more water and continued down before making it to the first clean slide on the run. We ran the slide and quickly got out to scout the next horizon line. The next drop turned out to be everything we were hoping for. A 50-foot bedrock granite slide with a clean line far river right, I felt like we were in California. What reminded me that we were in Idaho was the last second eddy we had to catch at the bottom of the slide right above a gnarly looking log. We set safety and Seth routed it first, and Ryan and I followed suit. We all made it through with good lines and no serious close encounters. This is what we came for; this is why we hiked our boats over that mountain; this is why I came to Idaho; this is why I kayak – Overcoming uncertainty and fear with the reward of being alive in the best of places with the best of people. Life is good. The money slide of the trip. Here I am following up Seth’s line. We continued downstream. Shortly after the slide, the river braided out before the confluence of Benedict creek came in. We portaged the log-jammed braided section and ventured slightly up Benedict creek upon Seth’s instinct before quickly coming to a small bonus slide. We slid in above the slide and followed the small creek back to the river. After the confluence, we came upon a ~30foot waterfall that had already been named “Smith Falls”. It looked like there might be a reconnect line that would go on the left side, but none of us were willing to be the one to find out how deep the pool is at the bottom and we all agreed it would better at higher water. 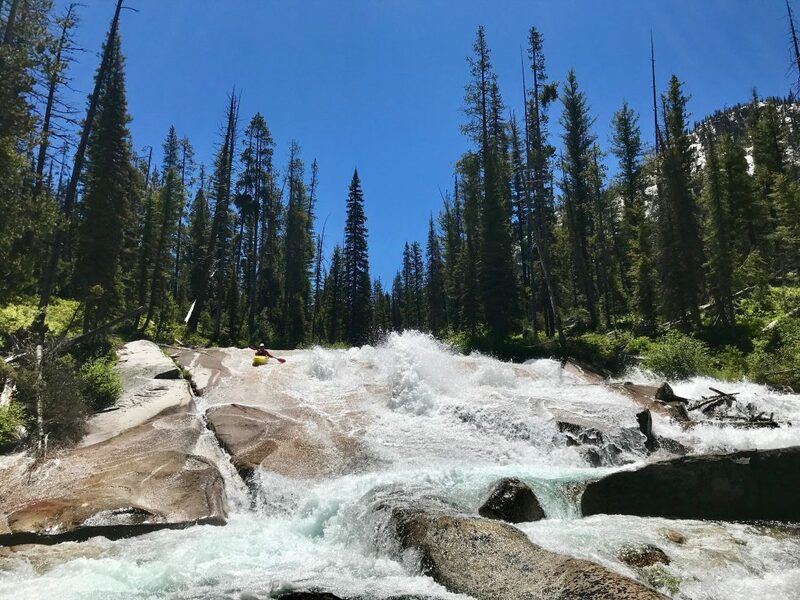 We made a quick portage then continued downstream through some fun class III-IV drops and ran one more big clean slide before stumbling upon what we later dubbed “Back in Nam Falls”. A long, steep, series of slides made up the biggest rapid we found on this section of the river. None of us saw a line in the rapid, so we all decided to portage river right where again, none of us found a good line to the bottom of the rapid, and we all ended up bushwhacking through a heinous maze of thick bush, brambles, and fallen trees. Once arriving at the bottom, we agreed that our experience might have come close to what it feels like to be in battle in the jungle. One of the cleaner slides in the upper canyon above Elk Lake. 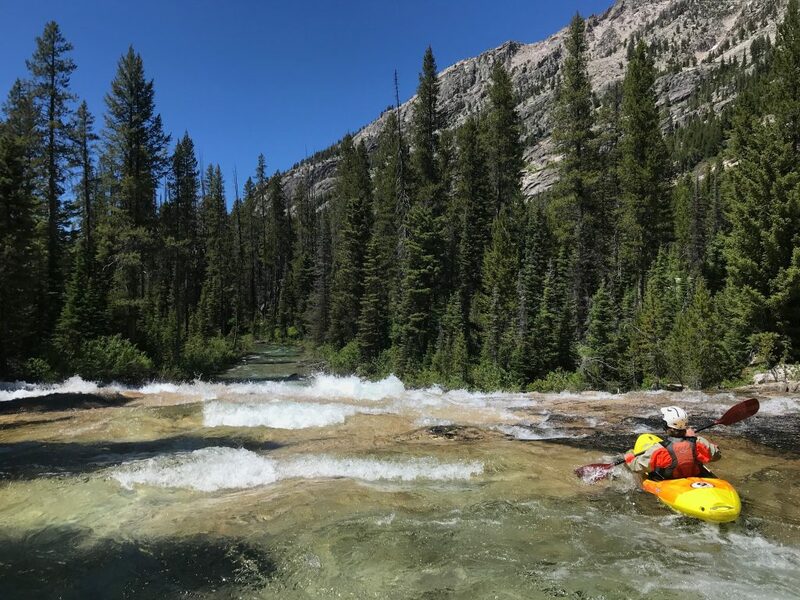 We continued downstream, did a couple of log portages, and ran into some backpackers that notified us that we were about a mile upstream of Elk Lake, which was our goal for that day. After reviewing camping options, we decided to camp where we were because it was a beautiful spot and far enough away from the lake that the mosquitos would not be as bad as the night before. We camped, sipped bourbon, and shared our excitement for how well our day went. The next day we woke up early and hiked down the trail 1 mile to Elk lake to avoid more log portaging, paddled across the lake and began making our way down the canyon with the goal of making it to Grand Jean by the end of the day. Elk Lake and the valley in which it sits is one of the most serene places I have visited. Towering peaks rose from the valley floor as dramatic cascades of Sawtooth snowmelt poured over. Exiting the lake, the river was now matured. The first rapid we came to was one of the most incredible pieces of whitewater I had ever laid my eyes on. Several slides and slot moves linked up to the grand finales of a ~40 ft roosting slide into back to back 10-foot drops. This was Fern Falls; we were expecting this. A couple of logs in the central part of the slide made it unrunnable although, even with the logs gone it would take a savage operator to give it a go. We portaged on the easily accessed trail on river right, got to the base of the cascading woody mess and continued downstream. The cleanest rapid in the whole lower canyon below elk lake offered a pretty choice boof. We bobbed, weaved, and portaged through and around many log jams. In this section, we ended up portaging far more rapids than we kayaked, and the canyon that we thought we would be through by lunch took us until 6 pm to finally get to the flatwater that remained above Grand Jean. There are many drops that we expected to see but ended up portaging around using the trail to conserve time. It would be possible to go back in with more time and possibly more water and pick off more of the drops. Ryan Holmes on the perfect mushroom boof in the lower canyon that was situated right above a terrifying toaster slot sieve. We ended the journey in Grand Jean where we had a vehicle waiting for us. Once we got to the car, we spent the evening hanging by the cool, clear waters of the South Fork laying around in the cleanest hot springs I’ve experienced, drinking wine and thinking about how much fun we just had.